It’s always good to have a variety of ways to prepare vegetables so that you do not get stuck in a rut. I have really enjoyed spaghetti squash this winter, but I usually end up just making spaghetti with it. I decided to step outside of my comfort zone and make an Asian style noodle dish. 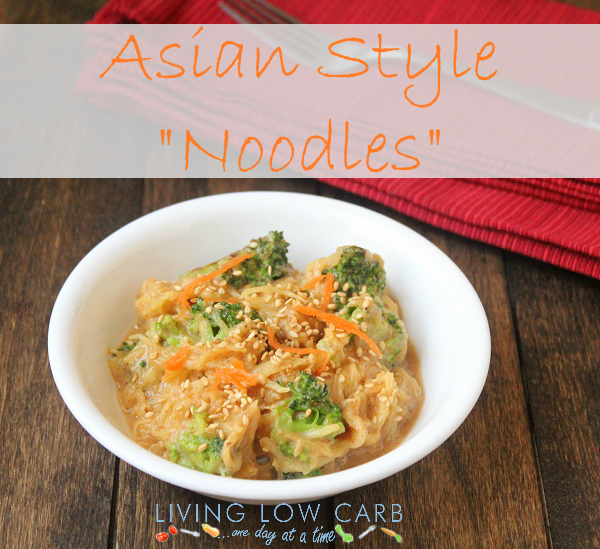 These noodles would pair perfectly with my Low Carb Teriyaki Meatballs. You may read the ingredients and wonder what some of them are. Coconut aminos, for example, may not be part of your normal low carb or paleo pantry. Coconut aminos is a soy free substitute for soy sauce and you can read more about it here. I love using coconut aminos in my sauces and to me it tastes much better than soy sauce (slightly sweet and less salty). Another ingredient that may be new to you is fish sauce. I first learned about fish sauce from Nom Nom Paleo and I have to admit I was hesitant to try it. Let me warn you to never smell the fish sauce because since it is made from anchovies is has a not so pleasant smell. Despite the smell, the fish sauce really adds a great depth of flavor without tasting fishy (plus a little goes a long way). I definitely recommend giving the fish sauce a try and make sure you use the Red Boat brand because it is sugar free. Looking for Breakfast recipes? Check out my new ebook Awaken: Click the image below for more info. Add the broccoli and carrots and sauté for 3-4 minutes or until mostly tender. Add the garlic and sauté for another 1-2 minutes. Add the spaghetti squash and stir to combine. Combine the remaining ingredients in a small bowl and add it to the spaghetti squash. Stir to combine and cook until heated through. The carb count will be reduced to 24 net carbs using zucchini noodles. *Note carb counts are estimated based on the products I used. Check nutrition labels for accurate carb counts and gluten information.